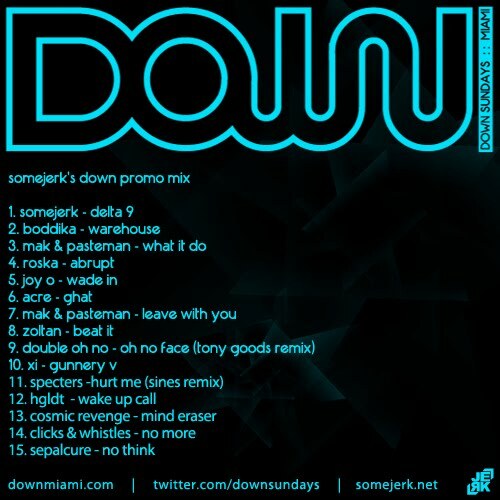 To promote the return of Down, the bi-weekly Sunday event that has now moved to Eve in Downtown Miami, somejerk has created a new mix, touching on a number of styles that he plays as it's new resident. This mix is an upbeat mish mash of electro, techno, garage and even a little dubstep in just under 39 minutes. Every other Sunday residents Gooddroid, Ashworth, Gray Ghost and somejerk present deep dubstep, garage, post-step and other forms of future bass via Eve's newly renovated side room. 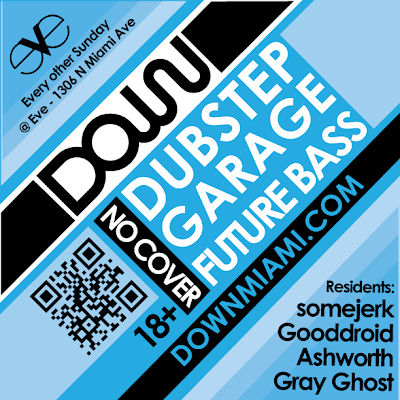 Visit DownMiami.com for more information on the event, which is 18+ and has no cover! You can also find Down Miami on Twitter and Facebook. 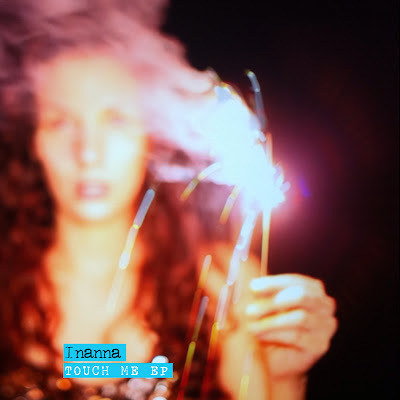 Inanna's Touch Me EP (DP002) has finally been released worldwide and is available online and at many fine retailers. On Side A is ‘Touch Me’ from LA-based producer Inanna. 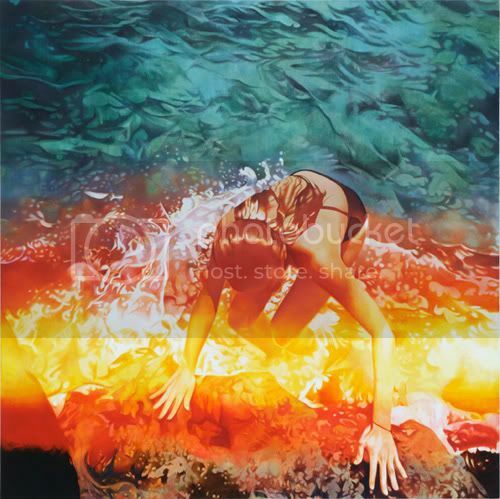 Her sound rests on lightness of touch and fluid rhythmic progression, where atmospheric enchantment and expansive moods are equal to her rigidly precise beatscapes and judiciously deployed subs. Inanna’s previous work has been described as art to be displayed in an audiophile gallery, and she is rapidly forging a reputation as one of North America’s premier (modern) garage selectors. The six-minute original version of ‘Touch Me’ takes a haunting twighlight path through garage zones, where light flickers through the trees and sounds dart among the undergrowth like half-glimpsed wildlife, curiously observing the listener from a safe distance. Ptr1’s remix re-invents the track as a more club-friendly excursion, ramping up the rhythmic dominance for a swung session of refined 2-step, with a snappy sharpness complimenting the echoing melancholy backgrounds. In contrast, Canada’s NVS offers an esoteric angle on the low end with ‘Cry Wolf’ on Side B, a slow-tempo looping-vs-fractured groove coming from the same spaces as Mount Kimbie’s more brittle, abstract work. DP003 from Porphyro will be released soon. Also make check out Gooddroid's latest mix for BassHead TV titled 'Midnight'. Thursday's GET LOW was another for the history books! 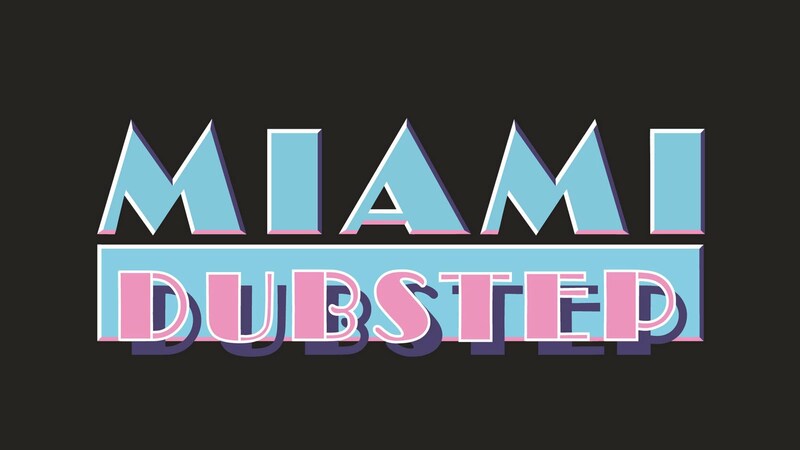 With the exceptional music and packed house of energetic Miami Dubsteppers, it was definitely one of the best nights we've had. 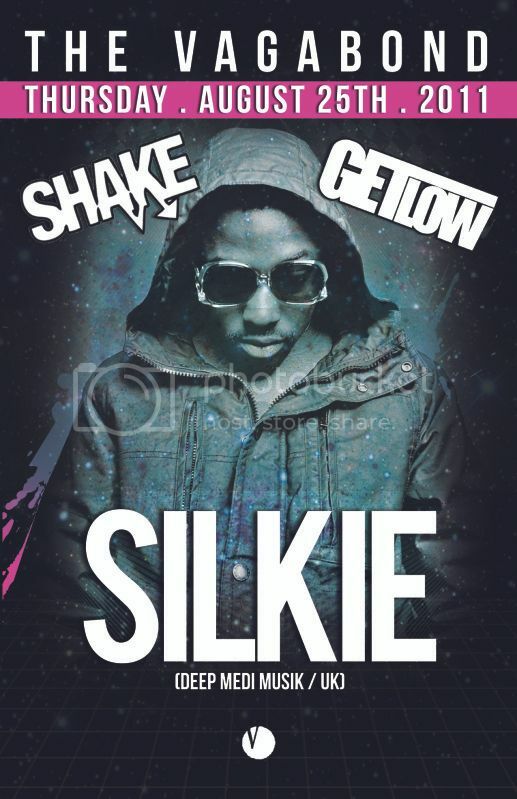 Big up the people who made the bootleg GET LOW shirts! Awesome to see that love. Another person told me we had the best party in Miami, and I have to agree! Thanks to everyone for being a part of it. If you went out on The Vagabond patio from 12-1 that night, you caught a fantastic set by THE GET. If you loved it or missed it, you're in luck! 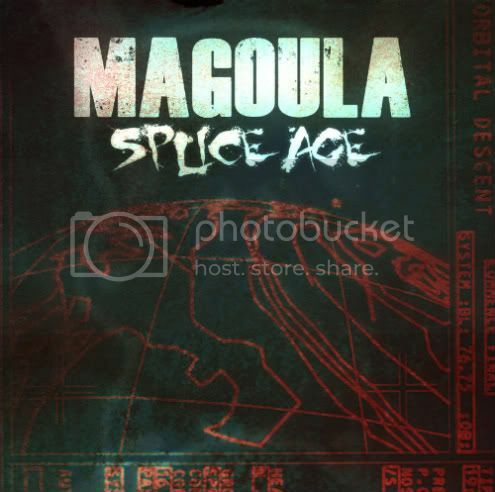 He put it up for download with a tracklist you can find below. Enjoy! [UPDATE] The mix already reached it's download limit on Soundcloud, but THE GET hooked you up with a new link to download the mix! Hurricane Irene may have shut down IDentity Fest, but she's no match for GET LOW! Our honored guest for the evening is London's SILKIE. The Deep Medi badman is on a big North American tour in support of his new album City Limits 2, and he's making his Miami debut tonight! 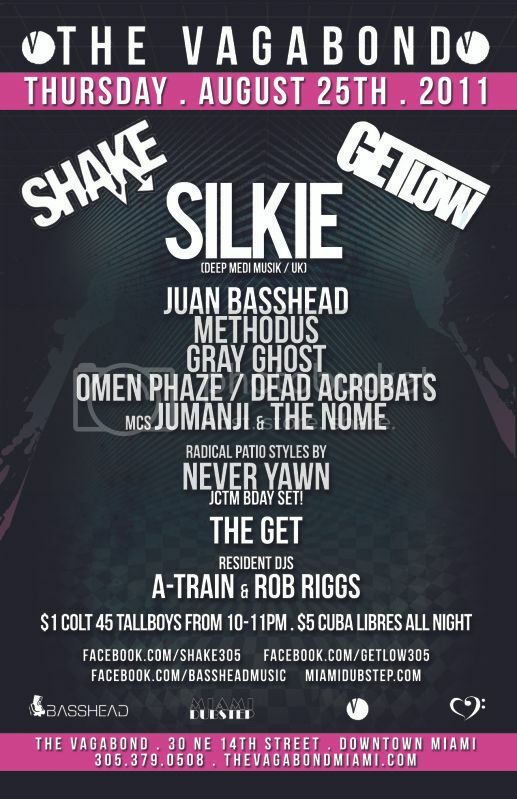 Your GET LOW residents JUAN BASSHEAD, MC JUMANJI & NOME are supporting with the best in local bass music. Joining them in the Arena will be Dubporn Records' GRAY GHOST, METHODUS returning for his first solo shot after killing it with Somejerk a couple times, and newcomer OMEN PHAZE. A-TRAIN & ROB RIGGS bring the hip hop and reggae in the Bar room. Outside on the Patio we welcome some new radical elements. Hopefully you checked out NEVER YAWN's mix they made for GET LOW, and you'll be celebrating JCTM's Bday with him! 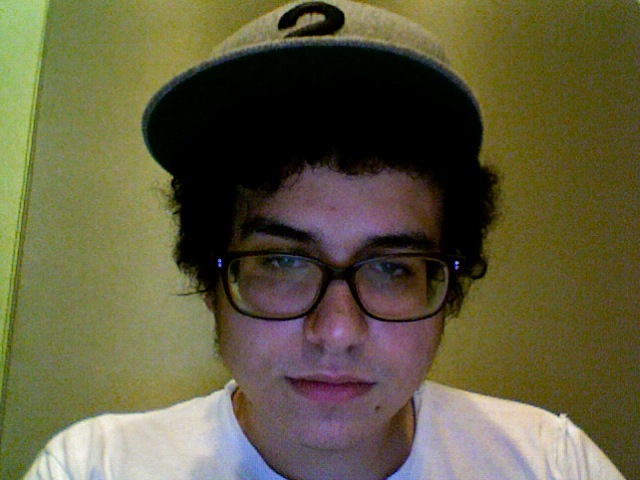 He's joined by LORRAINE SANGRE and rising West Palm producer THE GET. Hope you're all ready for a great night of bass! Make sure to like our page and follow on Twitter. Let's GET LOW! *SPECIAL ANNOUNCEMENT* Thursday, September 22nd GET LOW XXIX presents TUNNIDGE at The Vagabond. Hailing from London, with releases on Distance's label Chestplate, Deep Medi and forthcoming on Get Darker, this is one of dubstep's most promising young producers. 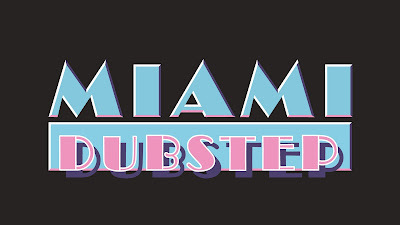 A collection of Miami Dubstep & Friends Desktop Wallpaper ready for download. Six desktop wallpapers and one for smartphones, including Basshead, Heartbeats, and Digital Felon. Special shout goes out to John, Shane, Gianna, Jsin, George, and Juan. Represent! In just over an hour (8-10pm) tune in to Radiate FM and catch NEVER YAWN on Two Way's Where Were U in '02 bass show! Get it on your radio: 95.3/88.1/96.9 FM or streaming wrgp.org.